No one will accuse early Grand Junction of being Tombstone or Dodge City, but early issues of the Grand Junction News reveal that the Grand Valley had its share of Old West crime. 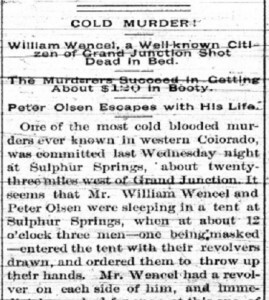 On November 25, 1882, the News reported that William Wencel of Grand Junction was robbed and shot to death in his tent by masked gunmen while he was camping in Sulphur Springs. Cold Murder! rang the headline, and subsequent issues mention a manhunt for the killers. On November 11, 1882, the News posted the provocative headline, Fatal Shooting: City Marshall Davis Shoots Mike Dunn through the Back While Trying to Escape Arrest. 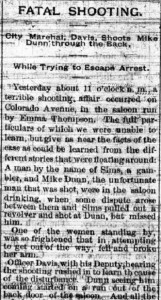 The story went on to detail an altercation between a gambler named Sims and the “very bad character” Dunn in a saloon on Colorado Avenue (the happening street in early Grand Junction). Sims pulled his gun, fired and missed. The Marshall ran in, Dunn ran out, and you can guess the rest from the story’s headline. Just one week after this incident, the Marshall posted bills around town detailing the City of Grand Junction’s ordinance against concealed weapons, which threatened concealed weapons carriers with a fine (in many Old West towns, such as Dodge City, firearms were prohibited altogether). Other, lesser criminal mischief also plagued the Grand Valley in late 1882. The News reported that a man “under the influence of tangleroot” fired his gun in a Colorado Avenue saloon. Thieves stole cash from the butchers Payne and Shockleton, and building materials for Grand Junction’s early buildings were often stolen. Chickens were reported stolen from Mr. Hutchinson on Rood Avenue, with neighbors waking to the sound of squawking and gunfire. And just down south in Montrose, townspeople confronted miscreants involved in lot jumping and ran them out of town. If you would like to see more of the Grand Junction News, go to our Central branch, where a staff member can direct you to the microfilm and show you how to use the reader. While you are here, visit our Rashleigh Regional History Room and its many great local and Western history selections. You can also search our catalog for books about the history of the Grand Valley.